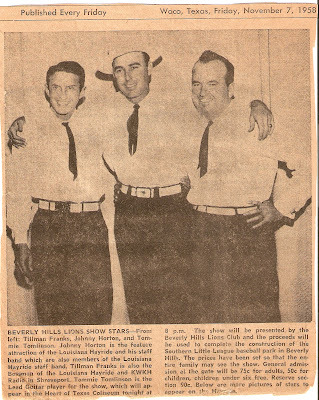 Bobby Horton's Melody Blog: Johnny Horton--Live in Waco--75 Cents! If you're like me, you dig Johnny Horton! We were playing in San Jose, California, several years ago when one of Johnny's distant relatives came up to us and introduced herself. She said that she had some memorabilia and told us she'd mail it to us. And--sure enough--she sent us a nice package of goodies. So I thought I'd share this newspaper clipping with you. (Note: that's actually Tomlinson on the left and Franks on the right.) Enjoy!